Techs can use FAQs to share information and quickly locate resolutions to common problems. In addition, clients can search the FAQ knowledge base within Web Help Desk to locate answers to their questions. Ensure that the tech permissions for FAQs are defined for each tech in Setup > Techs > Tech Permissions > Other Permissions. You can create a new FAQ manually, or you can automatically create an FAQ based on a ticket note. If your company is implementing knowledge-centered support, use this capability to quickly expand your knowledge base using information already captured in case notes. Before creating a new FAQ, search the knowledge base to determine if an existing FAQ answers the question. If so, you can link the existing FAQ to the ticket. Log in to Web Help Desk as an administrator. Click Setup > Techs > Tech permissions. Click the tech permission name. Scroll down to the Other Permissions tab. 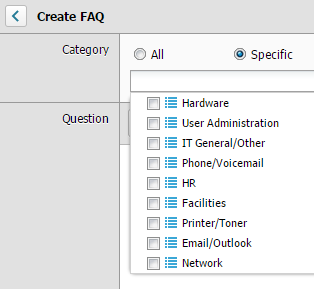 Select FAQs "All" Category Edit to enable tech access to All and Specific FAQ categories. This allows techs to view FAQs in the Create FAQ page for all requests. Select any additional selections as required. See the tooltips for details. Log in to the tech user interface. Click FAQs in the toolbar. Click New FAQ in the FAQ toolbar. The Create FAQ page displays. 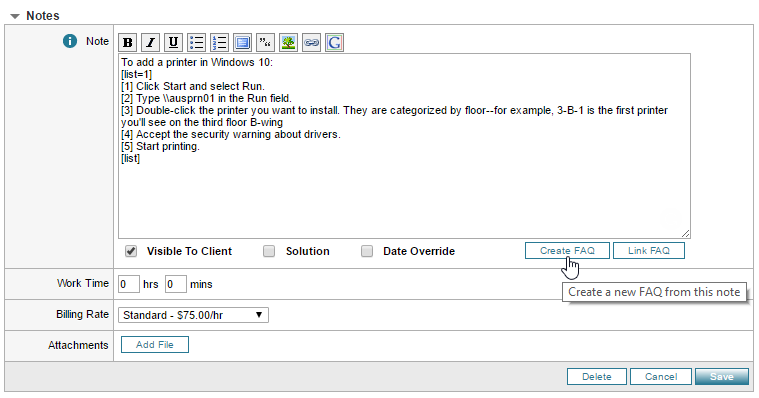 If you select FAQs "All" Category Edit in Setup, the tech can access All categories in the Create FAQ page. Category is identical to the ticket request type. The tech can also edit an FAQ by selecting Specific and clicking the drop-down arrow to select one or more categories for the FAQ. When you de-select the FAQ Edit check box, the remaining FAQ permissions are disabled in the Other Permissions tab. Additionally, the All and Specific categories in the tech user interface are disabled by default, and the tech cannot change the category selection. Techs can view FAQs assigned to All and Specific categories, but cannot edit these FAQs. See Define tech permissions to change the category permission for each tech. In the toolbar, click FAQs. In the FAQ toolbar, click New FAQ. In the Create FAQ screen, select the categories for this FAQ. Select All for all categories or Specific for selected categories. If you selected Specific, click the Category drop-down menu and select one or more categories. This field is populated from the ticket request types. You can add additional request types. See Define request types for more information. If a parent or child category is disabled, you do not have the appropriate permissions to access the category level. Enter the question and answer text for this FAQ. Question and answer text can include HTML links and formatting, as well as Bulletin Board Code (BBC) tags. If you want to link this FAQ to a related FAQ, click . Then search for the FAQ and click Link FAQ. Use the radio buttons to restrict who can view this FAQ or specify what model the FAQ applies to. In the Attachments row, click Add File to add an attachment, such as a supporting document, graphic, or spreadsheet. If you have permission to approve FAQs, select the Approved check box to publish the FAQ. Otherwise, notify an approver that the FAQ is ready for review. FAQs can be approved by all admins and by techs with the Approve FAQs permission. If you want the FAQ to expire, select an expiration date and time. Open the ticket and click the Ticket Details tab. In the Date column of the Notes section, click in the note's creation date and time to open the note. In the note editor, click Create FAQ. Click OK at the confirmation dialog to create the FAQ. The FAQ is created, but it is not approved. Also, any attachments to the note are not attached to the FAQ. Search for the FAQ, select it, and click Edit. Edit the Question and Answer text to make it appropriate for a general audience. For example, remove people's names and company-specific information. If the note included an attachment, attach that file to the FAQ. If necessary, first download the attachment from the ticket to your computer, and then attach it to the FAQ.